Buying Guide for Skylight Blackout Shades | Order Online! - BlindsOnLine.com Inc. Whether it’s during the morning or at night, some people just loathe when sunlight enters their homes. Other people want the sun’s light to touch every inch of their home; however, if you are looking for a happy medium between these two extremes, why not consider skylight blackout shades? Instead of preventing light from ever entering your home, skylight blackout shades allow you to control the amount and when it enters. In addition, these types of window treatments also allow you to regulate your ideal home temperature, thereby generating a warm and friendly atmosphere. Although skylight blackout shades are not the right window treatment for every home, there are many advantages to using them. The main reason individuals choose to install skylights is because of the spacious look they add to bedrooms. Moreover, blackout shades give you the flexibility to decide when you want to let the natural light brighten up your room. 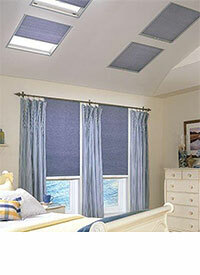 Our skylight blackout shades also come in a variety of different colors to match all interior styles. Skylight shades can come in many different styles; however, the blackout variety is the most effective at blocking out 99% of all visible light. Whether you are looking to create a home movie theatre or a completely dark sleeping environment for a small child, these unique window shading treatments are the perfect solution for all light blocking challenges. Skylight blackout shades are also made from a Mylar-Coated Polyester material to provide all rooms in the home with insulation that reduces the high costs of energy bills during the winter season. These shades are also constructed to be 3/8 inches by our white label manufacturers to ensure that they perform to the highest standards possible and last for many years to come. Furthermore, skylight blackout shades allow for flexible installation that corresponds with any homeowner’s spatial and design requirements. Whether customers require a sloped, horizontal, or vertical position skylight, our versatile systems offer customers a wide range of customizable options. 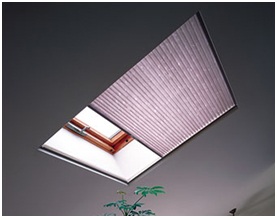 At BlindsOnLine.com DIY homeowners and contractors alike have the option of choosing from blackout or light filtering skylight shades. As you know, blackout shades work to block out 99% of all visible light. As you may surmise, light filtering shades do the opposite. Light filtering shades are less suited for bedrooms and home theatres and more suited for living rooms and places where you want to add natural light or create a more spacious environment. If you choose to purchase your skylight blackout shades online, there are a few things you should know about installing them. Skylights are difficult to install because they require precise measurements and fittings; incorrect installations can result in loss of heat and/or leaks when it rains, snows, or hails. Homeowners who lack previous skylight installation experience are encouraged to hire a professional contractor to install it for them. Even if you have a good idea of what you are doing, practice caution when using a drill and other power tools. Thanks to the internet, online shoppers can research their products in depth prior to ordering them. There are many websites that customers can choose from, but at BlindsOnLine.com, you can always feel confident knowing that you will be getting the most for your money. Many of our products, including the blackout skylight shades also come with mounting hardware and a limited lifetime warranty. Although we do not install window treatments ourselves, at BlindOnLine.com, we provide all of the necessary tools that you will need to do it yourself. Always remember to practice proper safety procedures and precautions if you are going to be working with any power tools. Now that you are armed with all of the above knowledge, you should feel confident enough to make an educated decision on whether skylight blackout shades should be your next DIY project. Browse our entire BlindsOnLine.com selection today and update your window views today.